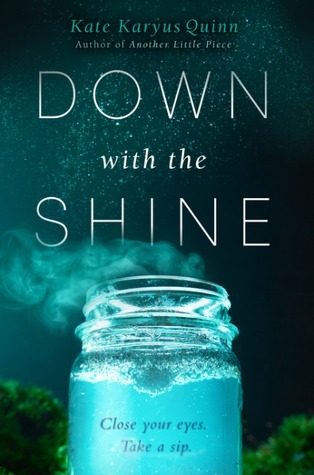 Down with the Shine, Kate Karyus Quinn’s third novel, starts with a prologue that promises a dark, twisted and very unusual book. The promise is strengthened by our knowledge about Quinn’s previous works, which were always gritty and weird enough to stand out. In Down with the Shine, Quinn takes her unusual approach even further by mixing ideas and genres, albeit with questionable results. It is, it would appear, entirely possible to try a bit too hard to be innovative and fresh. In many ways, this book reminded me of Bad Taste in Boys, but while Bad Taste was purposely silly and hilarious, Down with the Shine failed to be even that. ‘Be careful what you wish for’ is something we’ve all said many times in our lives, but rarely do we really stop to consider the possible consequences of our hidden desires coming true. Quinn explores the cost of wishes made haphazardly by a group of drunken teens, ranging from bat wings to love returned. Not a single wish turns out like the person wanted it to, and the results are often disastrous. As the daughter of a famous criminal, Lennie always found it hard to fit in. In an effort to join the popular crowd, she brings some of her uncles’ moonshine to a party and follows the tradition of granting wishes, not knowing they would actually come true. Lennie makes many mistakes from the start, but she’s actually the least to blame. The adults in her life failed her spectacularly, and her choice in friends and love interests left a lot to be desired. Her infatuation with her best friend’s brother made little sense from the start, and the more I witnessed their interactions, the more I wanted Lennie far, far away from Smith. I suppose Quinn was aiming for a darkly humorous tone, but Down with the Shine was neither particularly dark (dismembered bodies notwithstanding), nor was it successful in being humorous. That’s the main difference between this book and Bad Taste in Boys – the latter was ridiculous, but also hilarious. It helped that the book is compulsively readable and entertaining, although never laugh-out-loud funny. Quinn’s prose isn’t thick or pretentious, which makes it very easy to absorb, and she does know how to surprise her readers on every turn. While Down with the Shine isn’t her best work, it can be an enjoyable way to spend a Sunday afternoon. I love Quinn for the simple reason that she always gives us something different and even unique and always quirky. Yes, I think trying to be too unique and original can be a bad thing. Still, I like the idea behind this one. I'm curious. I was curious about this book. I saw it everywhere when it was released. I don't think it's the right book for me. I haven't read anything by her just yet, but she's on my list of authors to try. This looked like it had a good premise, but the fact that the humor and the darkness didn't work is a shame. I'll have to pick something else if I ever get to reading it. I keep meaning to read this author! I have one of her books in my TBR pile that I keep meaning to read! This is another I had high hopes for because of its somewhat magical twist. Sad to hear it wasn't everything you hoped for, but glad it was still a fun read! Nice review! Ah well. There goes my hope that this one will save my not-so great opinion about her work. I didn't enjoy her debut a few years ago, but I remained optimistic about this one. Sigh. Lovely review Maja. I have yet to try this author. Excellent. Her best work yet. Kate's work gets stronger with every effort. The premise is definitely very interesting but i agree, It tries to funny but fails big time..